Well, I just can’t leave anything alone can I? After the comment from foolery the other day linking to two other tamale pie recipes, and the comment from GrammA that it sounded rather bland, I got to thinking how the tamale pie could be made a little more “my style.” That of course involves lots of garlic, no corn, some black beans and my first experience with corn meal. First, I made up the mush as per Gram’s recipe. I may do this differently if I make this again, as it was rather, well, mushy. I thought it would congeal into a more bready substance, like corn bread. 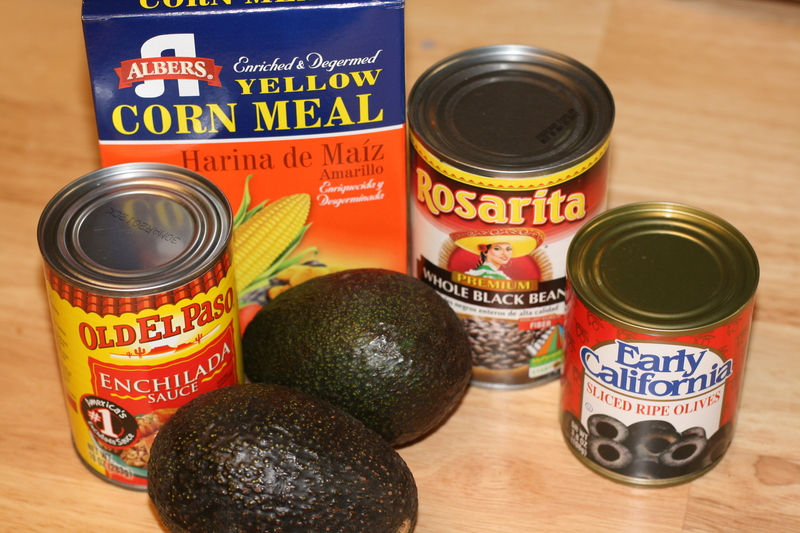 It is possible I didn’t cook it long enough, or that corn meal of Gram’s era was a little different than what I have. Who knows. Anyhow, while that was cooling a bit, I cooked ground beef, garlic, onion and chopped up zucchini. I was hoping to sneak a bit of veggie into my daughter, but she saw the green. Next time I’ll shred it. 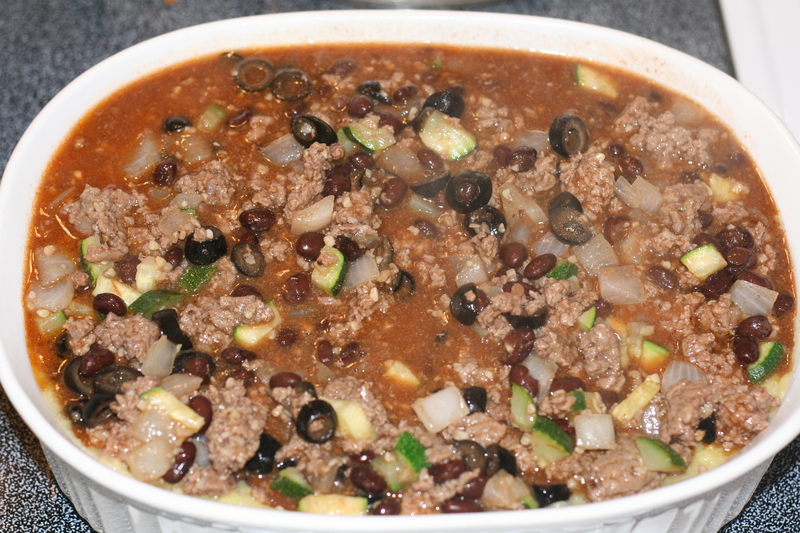 Once that was cooked, I added in enchilada sauce, black beans (drained) and sliced black olives (also drained). I simmered the whole thing a little bit longer, then poured it over the mush layer in my casserole dish. I used a 2.5 quart casserole and it was brimming to the very top. 3 quart is a must if you play with the recipes like I do. I carefully put the remainder of the mush on top, then cheese. I tried 275 in the oven and that didn’t do very much but make the cheese flexible, so I upped the temp to 350 until the cheese was bubbly. My family enjoyed it and there was a ridiculous amount left over. I’ll probably try this one more time with a few additional changes. Even with the enchilada sauce in place of tomato sauce, it was still a bit bland. Mixing taco seasoning with the ground beef would kick it up a notch, and even using the red pepper that the recipe calls for would be good too. Now you’re cooking! 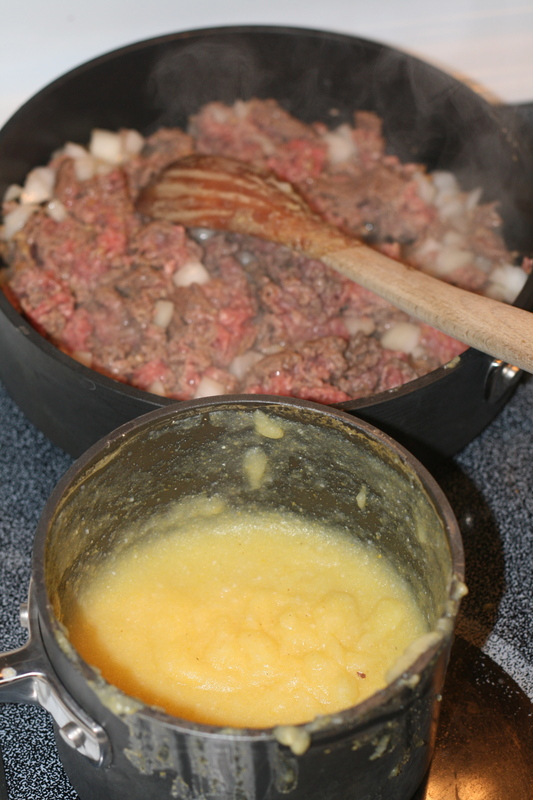 I often use heaps of raw minced garlic, and a tiny shake of cayenne or two shakes of Tapatio. If you use hot sauce I recommend Tapatio over Tabasco, which I think is too vinegar-y. Never tried black beans, which is odd considering I put them in EVERYTHING. I also want to try the cornbready topping. Mmmmmmmm, tamale pie. We are big fans of Cholula sauce in my house, I’d probably use that in place of Tapatio. I think that might do instead of taco seasoning as well. Mmmmmmm!!! That looks soooo goooood! I think I’ll try making that this weekend.